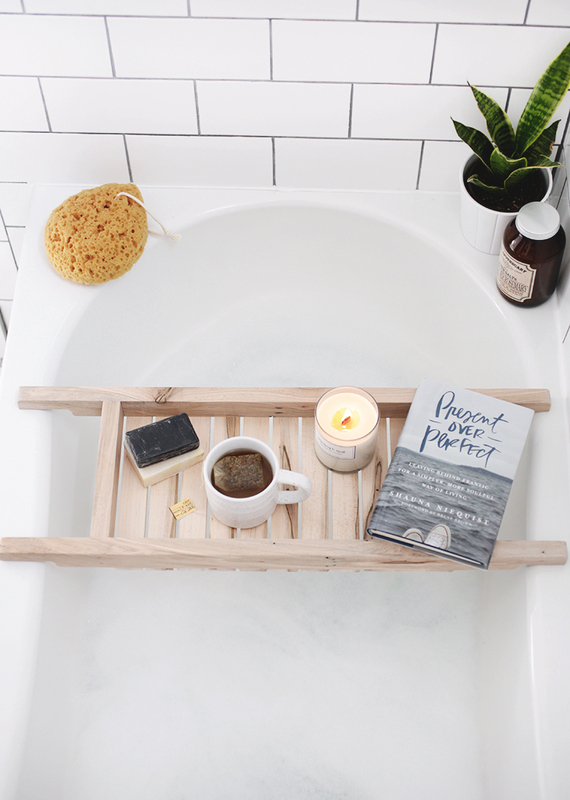 Now that fall is here and we’re starting to have a few cooler days here & there, bath season can begin! Haa! I never used to be a bath taker, until more recently. 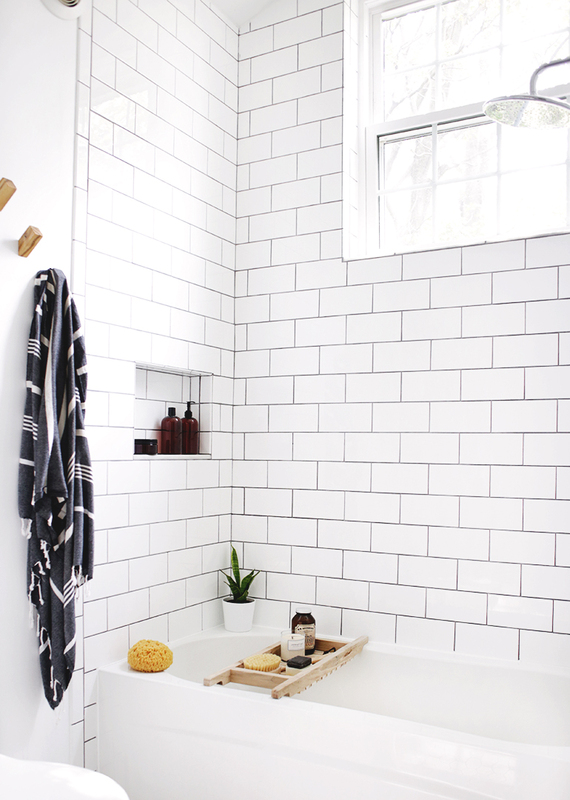 Having a pretty bathroom helps…as does having sore muscles from running. I’m especially feeling the need for hot soaks after this past weekend – Mike & I went away over the weekend for our annual anniversary trip, and I climbed my first two high peaks in the Adirondacks! My calves are feeling it fo’ sure! So of course since I’m using the bathtub more, I need all the fun accessories to go with it, so I had Mike make a bathtub caddy! I couldn’t decide whether to go with a simple wood slab tray or something a little more involved, but in thinking about my clumsiness, decided a style like this would be a little safer for my things!😆 Since we’ve already made a few different things for this bathroom with spalted maple (towel hooks and toilet paper holder), that was my wood of choice. 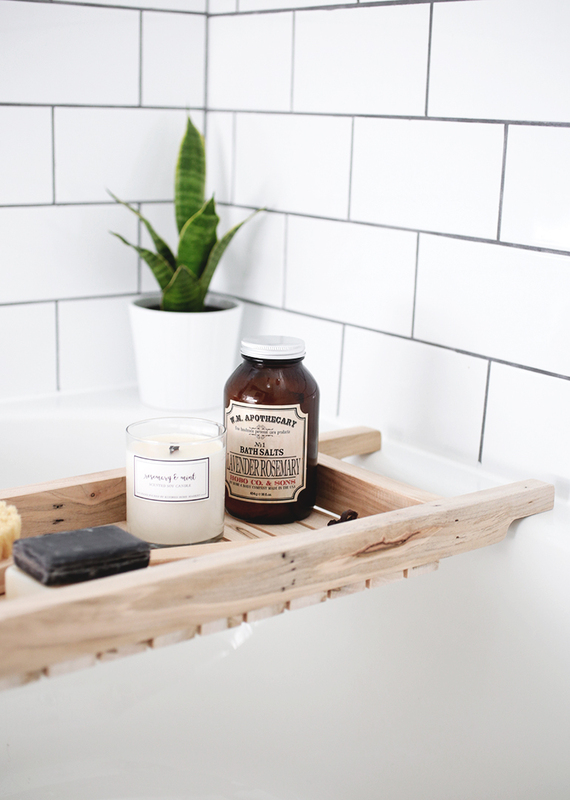 But cedar is always a good choice to use in bathrooms (like we used for this bath mat) since it’s a more water-resistant wood. – Cut two strips of the wood 35” long by 1-1/2” wide. – Power plane the edges of both pieces to get rid of the saw marks. – Out of the pieces, cut two 27” pieces and two 7-1/2” pieces. – On the long pieces, make a mark 2-1/4” in from each end and a mark from the bottom 5/8”. – Going from the end to the 2-1/4” line, use a circle template to draw a curve where they connect. – Use the jig saw to cut this marked out section from each end. – From the left over sections of wood, cut two pieces 7-1/2” long. – Make a mark 4-1/2” in from the ends of the long pieces, using the nail gun, nail the short pieces to the long pieces, centering them on this line. – With the table saw, cut a piece of maple 1-/38” wide by 60” long. Cut this piece in half giving you 2 pieces 5/16” by 60” long. – Use the power planer to remove the saw marks. – Measure the width of your shelf frame and cut 11 pieces of the thin wood to this length. – Determine the spacing which will leave you with even gaps at the ends. We started with a piece centered in the middle and nailed both ends,and then using two 1/4” spacers, nailed the rest of the pieces on with the 1/4” gap between each piece. – Sand and apply finish, following directions on paint can. (You can see more details & sources on this bathroom here). 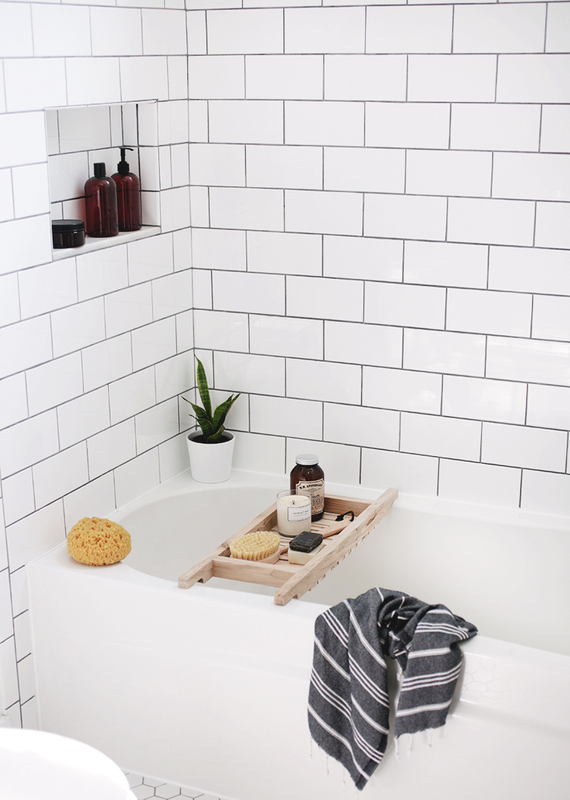 This bathtub caddy is beautiful! Can’t wait to make this!